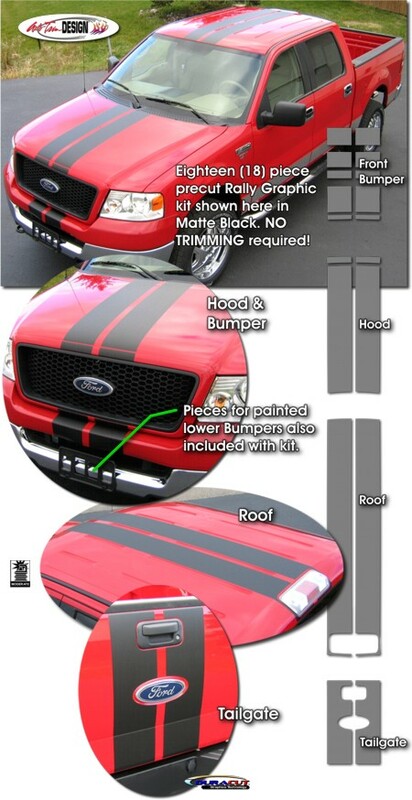 Make your '04-'08 Ford F-150 "Tough-looking" with this awesome Rally Stripe bumper, grille, hood, roof and tailgate graphics kit. This easy-to-install kit is packaged as a set of eighteen (18) pieces. They're PRECUT and ready to install in a wide variety of colors - NO TRIMMING required! Kit includes pieces for factory painted Lower Bumper areas. This stripe package is not just a set of 7.25" (18.42cm) strips in a box. Our graphic kit consists of prefitted and contoured pieces as shown in the illustration. Kit is specifically made for the '04-'08 Ford F-150 factory bumper, grille, hood, roof and tailgate areas and will not fit any other vehicle. Rally stripes are set for 1.5" (38.10mm) center spacing at time of installation. Optional Hood Scoop and Hard Tonneau Cover Stripe kits are available. Due to different size configurations of Hood Scoops and Tonneau Covers, stripes require trimming after installation is complete. Trimmable Hood Scoop kit is provide with two (2) 20" (50.80cm) long pieces.